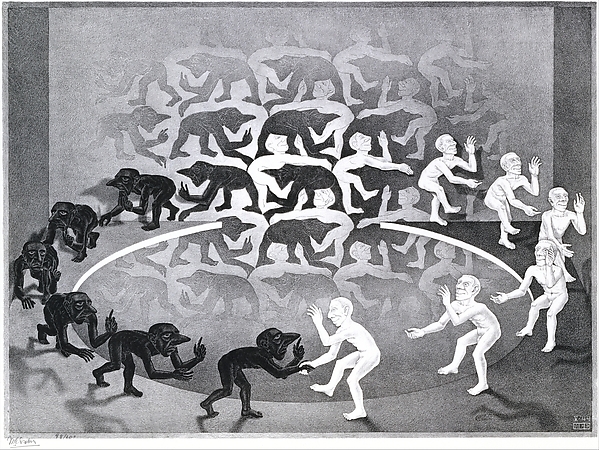 Modern Art Monday - our little Modern Art 101 - continues in week two with a reintroduction to the work of M. C. Escher. His self portrait (below) reveals his stark style. One of the world's most famous graphic artists, his rich work is rooted in an appreciation for mathematics. His impossible landscapes and dark imagery is stylistically his and influenced pop culture and science fiction. You can read more on him here. During his lifetime he was a prolific artist while also illustrating books, tapestries and even postage stamps. His work represents an observation of his world: a mix of architecture and artistry.